The Mill Network at Kinderdijk-Elshout is a construction set up for draining and protecting an area by the development and application of hydraulic technology. Kinderdijk is a small town near Rotterdam, situated in an area called the Alblasserwaard. This part of the Netherlands lies below sea-level, and has a history of floods. 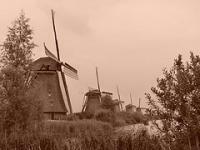 The 19 windmills of Kinderdijk were built around 1740. Their purpose was to pump the excess water into a reservoir until the level of the river had reached a level that pumping the water into the river (called the Lek) was possible again. Since 1927 a diesel pumping station does the real job. 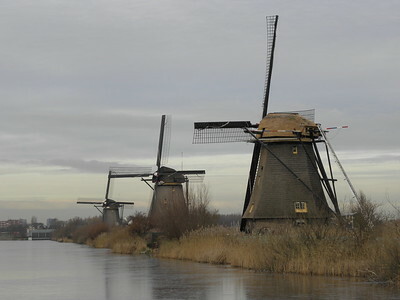 The windmills were used for the last time during the second World War, when the mechanical pumps could not be used any more due to fuel shortages. During the summer months, the mills are put back in operation again to please the tourists. In one of the windmills a small museum is established with an exhibition about how miller-families lived. You can also walk or cycle along the canals and river to take a closer look at the mills and enjoy the landscape. At my first visit, everything was quiet on that Sunday morning. The locals locked up in church, the (foreign) tourists back home again. That made the site the least tourist one that I have visited so far. And no entrance fee! The landscape resembles a classical Dutch painting. Winter in Holland, or something like that. But do not try to look behind this postcard-like picture, because then the industrial areas come in sight again. My second visit was on a weekday in December. It was freezing cold, but I like the stroll on this path along the mills. There were a couple of other people around, some joggers, some people taking photos. At my way out I encountered a Japanese tour group that only had a quick look at the first couple of windmills and then went back to their bus which had kept its engine running. The walk to the last mill, at the end of the second row that stretches out to the left, takes about half an hour. Usually there are a lot of water birds here, but the only noise I heard now was the rustling of the reeds (at first I thought there were mice!). 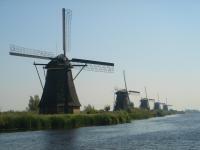 The windmills are divided into 2 groups by their way of construction, and there's an odd one out (a water mill). Simple signboards tell their story. The Mill Network at Kinderdijk-Elshout was the Dutch World Heritage Site I was most excited to visit when I traveled to the Netherlands in the summer of 2014. When I was growing up, I had associated windmills with the Netherlands, but I hadn't realized their role in water management until I arrived at Kinderdijk. A theater at the visitor center showed a movie explaining how the mills worked to pump water out of the lower land of the polder so it could be drained into rivers -- I'm rather in awe at the engineering ingenuity the Dutch employed here and throughout the country! Kinderdijk is an outdoor museum of 19 windmills picturesquely situated along canals in a polder just a short distance east of Rotterdam. I had intended to rent a bicycle in Rotterdam to take with me to Kinderdijk, but there were no bikes available at rental sites. Despite the setback, I enjoyed a relaxing walk on the paths to the windmills, stopping to take in the views of the turning sails reflected in the canals. Two of the windmills were open for visitors on the Saturday of my visit, allowing visitors the opportunity to see the gears and living areas inside the mills. This complex is a fine and memorable piece of Dutch heritage on the World Heritage Site list. Logistics: Kinderdijk can be reached by private transportation or, on weekends between May and September, by boat from Rotterdam (requiring a boat change at Ridderkirk for Kinderdijk). Nice site. We expected little more than an easy Sunday afternoon walk along the water with some mills in the background. However, if you buy a ticket a short film in the 'gemaal' (the machines taking over the role of the mills) explains the functions of the mills and you can visit two (working) mills. One mill can be visited from bottom to top while the other is limited to the ground floor. This gives an interesting insight in the lives of the millers anf their families. In both mills also a guide is present explaining the mill mechanics. Interesting site around what the Dutch do best, i.e. water management. I visited this WHS in September 2010. 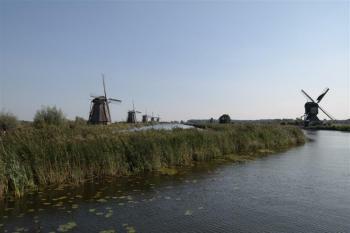 The windmill network is best viewed by boat through the various dykes and canals. The highlight of my visit were the thousands of tulips in full bloom just opposite the WHS, which created a postcard-perfect photograph. On a typically Dutch June day (cool and rainy) I did a pleasant boat trip out of Rotterdam to the mills at Kinderdijk. This is really a classic Dutch landscape - windmills, canals, cow pastures, guys in wooden shoes, and as such is an interesting contrast to the soulless skyscrapers of nearby Rotterdam. It is pretty touristy (they sell brochures in Japanese and Chinese), but it is still a very idyllic place, where you can also watch an interesting birdlife. I'm not sure if its place on the WH list is entirely justified (o.k., there are no other windmills represented), but it is definitely an interesting excursion. Studied in Rotterdam for two years, Kinderdijk was just 30 minutes from my dormitory and every time I did not know where to go, Kinderdijk was my favorite place. 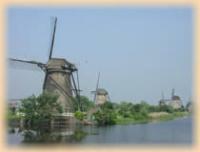 The complex of 19 windmills is very picturesque and draws a lot of tourist so this place is quite popular. 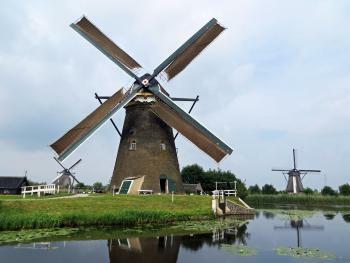 In Netherlands, there are two places that famous for windmills. One is in Zaanse Schans near Amsterdam, another one is in Kinderdijk. You can not compare these two as they are totally different; Zaanse Schans’s windmills are used for making flour, colure powder and etc., while windmills in Kinderdijk are built for water management. So it would be good for you if you visit both places. I visited Kinderdijk in every seasons and each time has its own charm. Spring time gives you a fresh smell of grass and water. Summer is quite hot and full with tourist but lively and in summer weekend afternoon, all 19 windmills will unlock and you will have opportunity to see the spectacular scene of “ 19 working windmills”. Autumn and winter are also nice with fewer tourists. Beware of bicycles as Kinderdijk is part of bike route that crisscross this area, so while admiring windmills please look behide you as the bikes are coming! This is a really lovely place to visit, there are 19 windmills in a very small area, making it the ideal place to see one of the classic images of Holland. The majority of the mills were built in the eighteenth century and are spread along the central canals. You can notice the difference between the levels of water in the different canals, especially when compared to the much higher level of water in the River Lek. One of the windmills was in action when we visited, and apparently on Saturdays during the summer all 19 mills are started up, the only place in the Netherlands where this happens. The second Mill we came across was opened as a museum for you to have a look around. It was quite interesting to look around and realise that these were not only machines for moving water but also houses and had very cramped living conditions. For those that care the UNESCO plaque is actually inside this Mill. 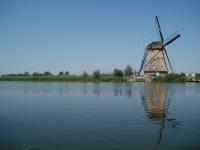 The Mill’s are 15km south of Rotterdam and you can catch a ferry down, it stops en route to Dordrecht. We travelled from Utrecht, there is an hourly bus (30 minutes past each hour from Utrecht Centraal) which takes an hour and a half to get there, the bus carries onto Rotterdam Zuidplien. As a final note I would like to give a recommendation for the Restaurant aux Moulin’s, where they were very nice and cooked us omelettes after they had stopped serving, so that we didn’t get on the bus with empty stomachs! I travel quite abit being a Retiree and yet, enjoy the leisures that accompanies my portfolio with a Real Estate Company active on the Thai exclusive regions. Sometimes, my dog travels with me, depending on the duration at any one destination regarding the routine hassle of quarantine etc. This day being in Holland, the Winter is lifting and Spring is soon showing its natural signs, I'm back in Holland and on Monday, after a late & long sleep-in, had a midday brunch, saw the skies brightening despite the hesitant clouds hovering, i felt the chances are good to go enjoy a reminiscent stroll by Kinderdijk. The last time I was there was in 1978 and both my wife and me had a very romantic stroll amidst the white powders of Dutch snow that blanketed the whole region... making it a dream on clouds above the lowlands here within close proximity of Rotterdam. Treated ourselves to an afternoon breath of fresh air for a Monday. I am sure for those that were here, enjoyed strolling along and appreciated the Windmill scenery and for those who have not been to this part of Holland before or heard little about it, may someday visit Kinderdijk. You are all welcome to do so and as much as I enjoyed the afternoon treat, you will yourself! I've been to Kinderdijk by bike a few years ago. It's the only place where you can catch so many windmills in a single photoshot. Tourist should also be aware of the many windmills across the country, almost every town has one. Just go and visit them; many owners will be willing to show you inside for free or a small payment. my husband and I visited Kinderdijk in July 2003, we went with a Dutch couple we had gotten to know really well through ICQ. our visit to Kinderijk was wonderful, we loved seeing the windmills;they were magnificent! Directly via bus #90 to Kinderdijk Molenkade, leaving from either Rotterdam Zuidplein Station or Utrecht Central Station. 291 Community Members have visited.